Serve with rice and black bean salad and your favourite cold beverages. Trim silver skin from tenderloin with thin knife. Mix remaining ingredients in large zip-top plastic bag. Add pork, close, and refrigerate at least 30 minutes, up to 4 hours. Prepare outdoor grill for direct medium-hot grilling. Lightly oil cooking grate. 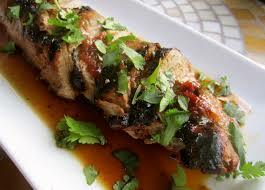 Remove pork from marinade, drain briefly, but do not scrape off solids. Place pork on grill and close grill lid. Cook, turning occasionally, until browned and internal temperature of pork on a meat thermometer measures between 145F (medium rare) and 160F (medium), about 20-27 minutes. Transfer to carving board and rest 3-5 minutes. Cut on slight diagonal and serve.